The Music Maker Relief Foundation was formed to provide much-needed exposure as well as assistance to traditional blues artists across the United States. Founder Tim Duffy has done an admirable job in this task, and has drawn the support of musical heavyweights like Eric Clapton and Taj Mahal. These three CDs represent the first of what will hopefully be a complete series of albums by some of our hidden national treasures. Duffy has selected three longtime North Carolina artists, Etta Baker, John Dee Holeman, and Algia Mae Hinton, to kick off the series. Ironically, each of these performers appeared at the first festival I ever produced, held in Greensboro, N.C. in 1987 when I was president of the Piedmont Blues Preservation Society. So the discs reviewed here hold a special spot in my heart. 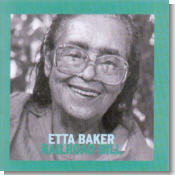 Etta Baker is probably the best-known of this trio of artists, having previously released an album for Rounder Records. She seldom sings while playing the guitar, and Railroad Bill is made up of 19 Piedmont-style instrumentals. Ms. Baker's guitar playing is breathtakingly beautiful, so the lack of vocals is not a problem. Music this nice doesn't need words. The disc opens with "Carolina Breakdown," a rollicking number with the sound of birds chirping in the background, giving the listener the feeling they're sitting on Ms. Baker's back porch. The title cut is spectacular; the words to this traditional blues song are included in the booklet in case you feel the urge to sing along. The closing cut, the traditional "Cripple Creek," features Ms. Baker playing the banjo, which of course was a very early blues instrument in her part of the country. The Piedmont style of blues owes a heavy debt to the bluegrass and old timey country music of the region, and this connection is quite evident here. Three chapters from the Book of Job are included with the liner notes; I suspect this was done to give us a little insight on the beliefs and values of this remarkable 86-year-old woman. 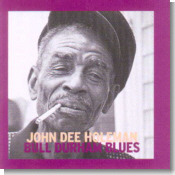 Like many blues players from the Triangle region of North Carolina, John Dee Holeman cut his blues teeth playing around the tobacco warehouses in the area. He learned his trade from guitarists who had played with the legendary Blind Boy Fuller, and the master's influence is evident in Holeman's steel-bodied hollow guitar work, especially on Fuller's traditional number "Step It Up and Go." Taj Mahal guests on "Mistreated Blues," playing great barrelhouse piano. The two also team up on what sounds like a precursor to modern-day rap, talking a blues patter while clapping hands on body on "Hambone." Holeman also takes a turn at showing the influences of white music on the Piedmont blues by playing a very nice version of the Flatt & Scruggs' gospel tune "God Loves His Children." The CD jacket includes a bonus of several folk tales from North Carolina storytellers. I believe I've saved the best for last. Honey Babe, from eastern North Carolina musician Algia Mae Hinton, shakes from start to finish. While Ms. Baker's guitar playing evokes an atmosphere of a relaxing day on the porch, Ms. Hinton's blues shouts out the phrase "house party." She plays both six and twelve string guitar, as well as banjo, and is an accomplished buck dancer. You can hear her fancy footwork on the instrumental "Buck Dance." Ms. Hinton picks up the banjo for the original uptempo number "Out of Jail," which also includes her haunting falsetto vocals. Her best guitar work is heard on the blues tune "When You Kill the Chicken Save Me the Head"; the guitar here has a beautiful resonant sound, reminiscent of Libba Cotten's work. I really can't say enough good things about this series of CDs...excellent music by sincere, genuine blues artists, nice booklets accompanying the discs, and a percentage of the proceeds benefit the Music Maker Relief Foundation. If you're into the deep stuff, then you'll want all three of these albums.